1 Combine beans with 250 ml (approximately 1 cup) of cold water in a bowl and soak for at least 12 hours. 2 Transfer beans with the water to a pot. Add 200 ml (approximately 3/4 cup) more water and bring to a boil, skimming off foam from surface with a slotted spoon. 3 Add the bay leaf and fennel to the beans. Cover and cook over low heat for about 20 minutes. 4 Meanwhile, peel the shallots and cut into small dice. Rinse celery, pat dry and remove any strings. Cut into about 5 mm (approximately 1/4-inch) slices. 5 Rinse 1 orange in hot water, wipe dry and remove 2/3 of zest in strips with a peeler. 6 Peel the orange, removing all the bitter white pith. Cut between membranes to remove whole segments. Juice remaining orange. 7 Add half of the orange zest along with the shallot and celery to pot of beans, cover and continue to cook over low heat for another 20 minutes. 8 Remove the skin from the duck breast. Add the vegetable broth and duck breast to the beans, cover and cook over low heat for 15-20 minutes. 9 Meanwhile, rinse tarragon, shake dry and pluck off the leaves. Reserve some for garnish and chop the rest finely. 10 Remove bay leaf and duck breast from the beans and vegetables. Season the duck breast with salt and pepper and wrap in aluminum foil. 11 Puree bean-vegetable mixture. Add orange juice and orange segments to the soup and heat through. Add chopped tarragon and season the soup with salt and pepper. 12 Cut duck breast into thin slices, and add the accumulated meat juices to the soup. 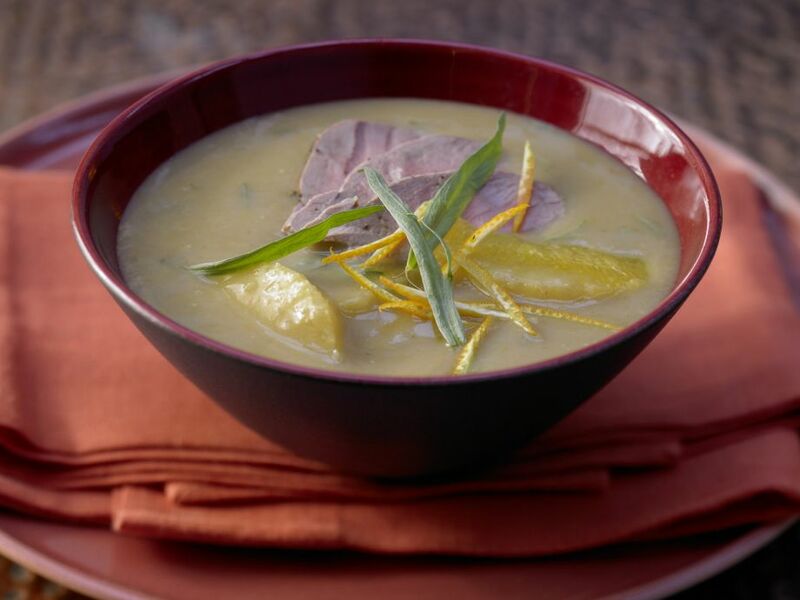 Divide soup among bowls, top with duck slices, garnish with remaining orange zest and tarragon leaves and serve.